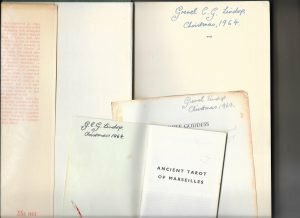 Over the holidays I found myself remembering earlier Christmases, and realising how important Christmas 1964 had been for me – and how grateful I am to my parents for making it so. I was 16 then, and my parents had got into the way of asking me what presents I’d like for Christmas. Extremely kind of them, and kinder still not to turn a hair when I asked for some fairly unusual things – especially unusual in those days, I suspect! 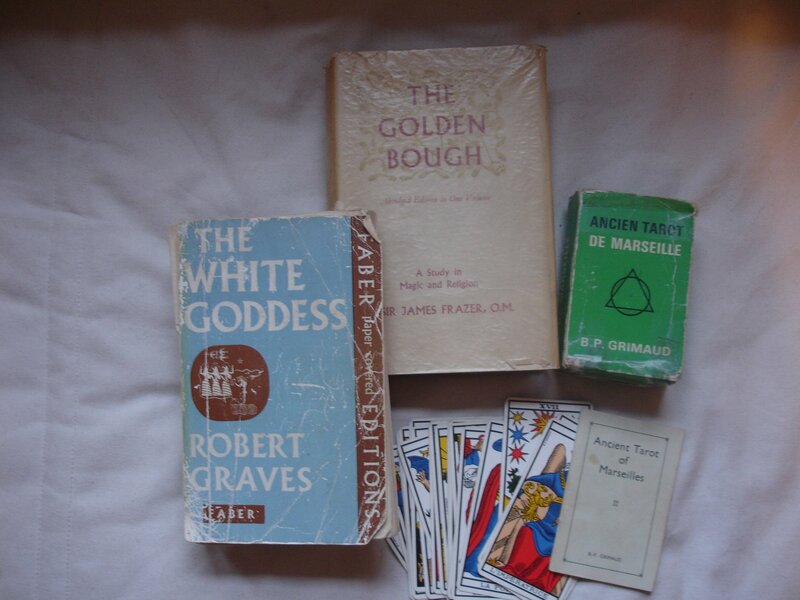 What they gave me, and what I must have asked for, though I don’t recall the asking, was: (a) a set of Tarot cards; (b) a copy of The Golden Bough; and (c) a copy of Robert Graves’s The White Goddess. They gave me all of them, and with the enthusiasm of youth – and a youth still in the process of discovering, or making, a self, I wrote my name in all of them. Three different versions of my name, in fact. With the date. And that’s how I know that all these wonderful things arrived at that particular Christmas. Those gifts led to a great deal. I’ve been interested in Tarot ever since, and at some periods of my life reading Tarot on a regular basis. 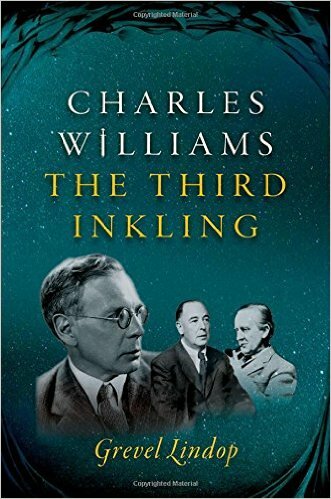 It helped me to appreciate Charles Williams’s novel The Greater Trumps far more deeply than I could otherwise have done. And I’ve just had the honour of reviewing Cherry Gilchrist’s excellent book Tarot Triumphs for Quest magazine in the US. As for The White Goddess, I sat up reading it every night between Christmas and New Year, utterly enchanted and fascinated. It made me want to read Robert Graves’s poems. I hadn’t read any modern poetry before, but together with The White Goddess those poems got me hooked. I wanted to write poems too. Graves’s books made me a poet, setting me on course for a lifetime. 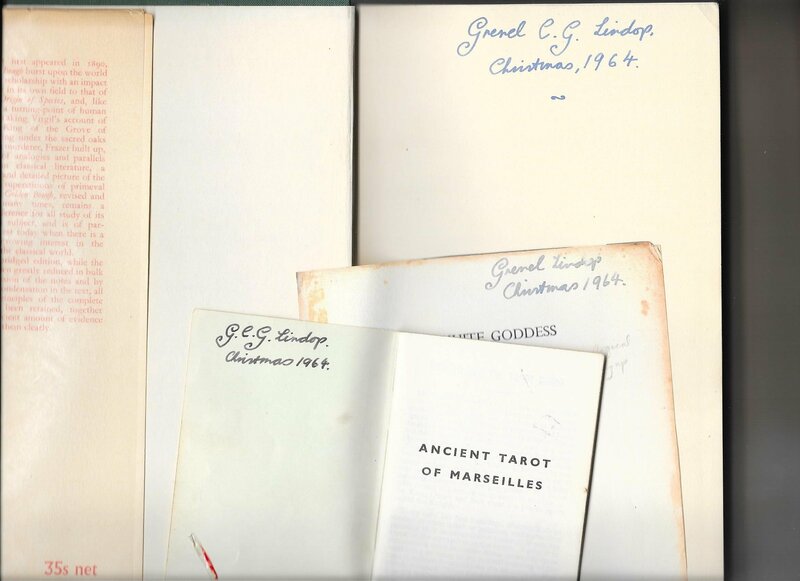 And in the 1990s I edited The White Goddess, working at Graves’s former house and getting to know the wonderful Graves family, and many Graves scholars. Again, life-changing. And Frazer? I have to admit that I’ve only read The Golden Bough right through once. It doesn’t quite have Graves’s verse and excitement. Nor do I wholly believe Frazer’s theories about the universal dying-vegetation-god cult any longer. With Ronald Hutton, I suspect that it’s our own secret religion, more than that of the ancient world. But how we need it! I’ve dipped into The Golden Bough many times to find details related to Graves, TS Eliot and other authors and things. And I really, really will try to read it once more in this life! Nice to see that in 1964 you could buy a new 756-page hardback for thirty-five shillings! That’s £1.75p in today’s money, or about $2.15. But what great foundations for an imaginative life! Blessings on my kind and understanding parents who listened to me and gave what Yeats might have called ‘the right twigs for an eagle’s nest’. I may be more of a jackdaw, but I’m still busy trying to build that nest, 42 years later. Happy New Year, all blessings to you, and may all your gifts prove as fruitful as these did for me!